How do you make a soap opera, acted out by Ken and Barbie-style plastic dolls, even nuttier? By adding viral sensation Tiny Hamster to the cast, of course! "To keep our fans excited, we implemented the same tactic used by other daytime soap operas: Casting a celebrity guest star," James Dawson-Hollis, McCann global executive creative director, tells Adweek. "Given that the cast of 'The Tiny and The Tasty' is only 12 inches tall, we were limited to using only very tiny celebrities. Naturally, Tiny Hamster came to mind." 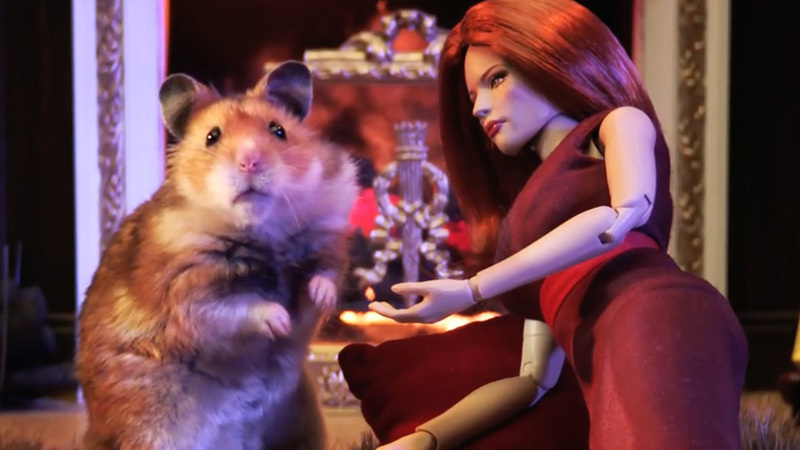 "It was clear from the beginning that Tiny Hamster and Ruthie were smitten with each other, and they quickly developed an on-set romance," Dawson-Hollis says. "If you look closely in 'The Affair,' you can see some light teeth marks on Ruthie's face, which were left by Tiny Hamster during one of their off-camera kissing scenes." We won't be looking that closely, but thanks. "Hamsters are naturally nocturnal, so many of the scenes had to be filmed when Tiny Hamster was running on less-than-adequate sleep," says Dawson-Hollis. "However, the actor remained a true professional the whole way through filming." Aww, those chubba-wubba cheeks! You get the idea. "We saw a lift in sales that corresponded when the campaign launched last year, and we are optimistic season two will drive the same growth," says Mark Chu, senior associate marketing manager for the General Mills brand. "The relaunch of French Toast Crunch in January 2015 was overwhelmingly successful. It was very obvious people wanted French Toast Crunch to come back." More spots for the campaign break later this summer, featuring a different diminutive guest star: Luke Perry's Thumb. "The mid-'90s were the golden era of daytime drama, and during this time Luke Perry's Thumb made audiences swoon when he starred on a popular television series," Dawson-Hollis says. "Now, the hunky appendage is bringing that same intensity, charisma and raw masculinity to the set of 'The Tiny & The Tasty.' "
Milking the soap opera concept with Tiny Hamster works well enough. But too many spoonfuls of self-conscious kookiness (Luke Perry's Thumb?!) could turn the campaign into a cereal offender.